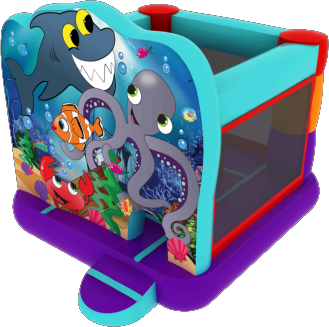 The Under The Sea Bounce House Slide Combo is brightly colored with all your favorite sea creatures for a fun party or event in Sacramento.This bounce house has a slide with a bounce area that will hold 4 to 5 kids at a time. This jump is smaller than the regular bounce house slide combo at 14Lx10Wx11H This bounce house is for younger kids 7 years and under. This slide bounce house combo will fit where the bigger bounce houses won't.